An understanding of biomechanics is important when working with amputees and people with prosthetic limbs. It is especially relevant to understanding how gait deviations and pressure problems occur and how they can be remedied. An understanding of biomechanics is essential for Prosthetists as it influences so many aspects of their work during prosthetic rehabilitation. 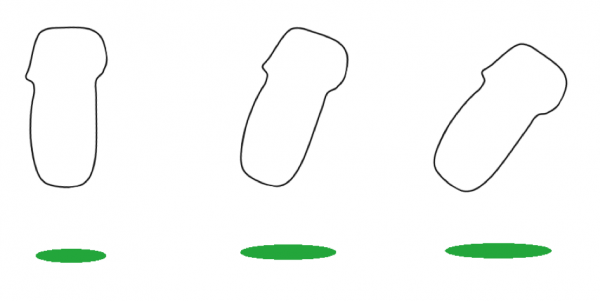 The following is a brief introduction to the basics of Biomechanics for Lower limb Prosthetics that can help people who are not Prosthetists better understand the area. A force is any interaction which tends to change the motion of an object. Forces are important in Prosthetic devices. A prosthetic device applies forces to the human body and can change the way forces interact with the body. When force is applied to the human body it is done over an area of skin. This produces pressure with the following equation. 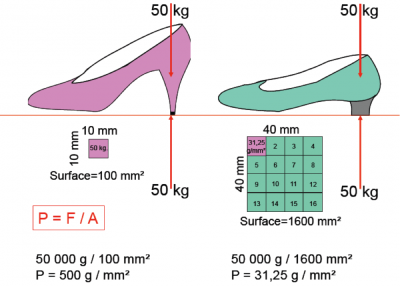 The heel of a stiletto shoe would cause large pressure per unit area. When the area is increased (in the picture on the right) the pressure is decreased. This idea is used in prosthetic socket design to attempt to spread force over a large enough area to reduce pressure to an acceptable amount. Often patients might ask for an uncomfortable part of a prosthesis to be removed. Sometimes when this is done the area that the force is spread over is reduced. Hence by the above equation P=F/A, the pressure is increased. This can lead to increased pain after some time. A general biomechanical principle is understanding the Centre of Mass, sometimes called the Centre of Gravity. It is the middle of the mass of an object and the force of gravity can be assumed to act on the object from this point. It is also the place that rotations will occur around. In an amputee because some mass is excised the center of the mass of the person changes. 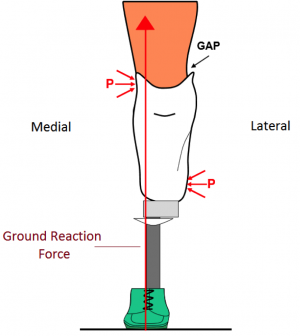 The Ground Reaction Force (GRF) occurs when contact occurs with a support surface, it is equalling and opposing the force due to body mass passing through the foot to the ground surface. 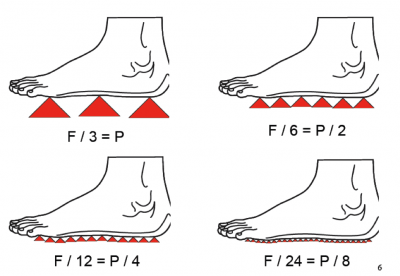 Prosthetic alignment alters gait by manipulating the position of the lower extremity and prosthetic joints with respect to ground reaction forces (read more here). The GRF is not used clinically in many places due to difficulty obtaining it in real time. Clinicians can try to understand the movements they see by understanding the effect the GRF might be having on the human body and prosthesis. People with Amputations have a lack of direct muscle control over some joints. People with amputations have missing body parts so there are cases where the muscle action is not available to act as a counter to the GRF as the muscle and joint are no longer present. If the GRF passes anterior to the ankle in a Trans Tibial Amputee then the ankle is permanently stiff enough to resist deforming into dorsiflexion. (This is not the case for powered prosthetic feet like the Propio foot from Ossur). In the case of a person with a TransFemoral amputation with free knee (with no locking mechanism) the GRF should be placed anterior to the knee for the duration of single limb support. 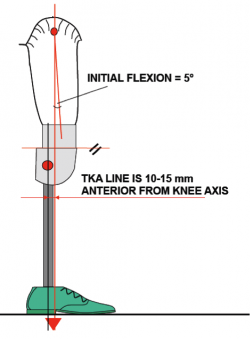 This is done in the following manner through static alignment using the more identifiable Trochanter Hip and Ankle (TKA) line. 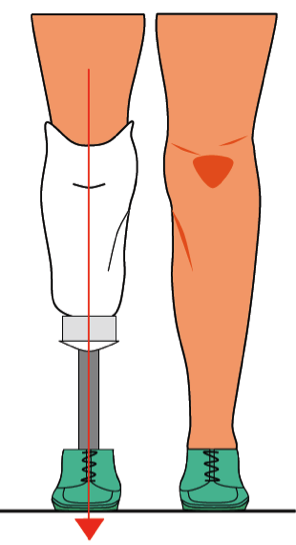 In this scenario the person with the amputation continues to have indirect control of the knee though the ability to extend the hip joint. When unwanted biomechanical situations present themselves Prosthetist may have the opportunity to alter the biomechanical situation, by fixing a joint to movement or by manipulating and moving the GRF to a more advantageous position. The forces of the body are normally transmitted from the skeletal system to the ground through the base of support which includes structures of the plantar aspect of the foot (calcaneus, lateral longitudinal arch, metatarsal heads and toes). In a lower limb amputee this structure may be missing. One of the main jobs of the lower limb prosthesis is to provide a medium for axial loading (otherwise known as vertical force transmission along the long axis of the body). In other words it must hold up the body weight in standing. The force produced by body weight `pushes` down on the prosthesis. The force passes through the prosthesis and down into the ground. The prosthesis must be strong enough to push up enough to hold this weight. Prosthetic components from manufacturers are rated to tolerate various weight tolerances. Custom made parts should be strong enough to bear the weight and can be made to recommendations or at the discretion of the Prosthetist. Axial loading is achieved by providing enough counter force to resist the effect of gravity. This force must be distributed across pressure tolerant areas. Good understanding of this is needed for prosthetic socket design. from person to the ground. The prosthetist loads skin with pressure in order to transmit forces from the prosthesis to the skeletal system of the amputee. If an area is ideal for axial loading then a large amount of force can be transmitted through it. Forces are generally provided parallel to the skin, reducing the amount of sheer forces. Supporting forces of a prosthesis on a stump are always parallel to the ground reaction force. 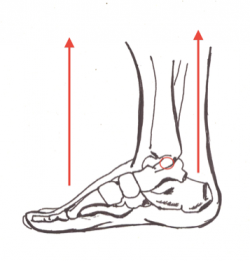 Changing the alignment (into some flexion) of the limb can affect the available area for vertical force transmission. The green area underneath the sockets in the below picture shows the available area for vertical force transmission. The more flexion that is added the more area is made available for vertical force transmission. Putting more flexion in the socket can have long term effects on joint range of motion and should be carefully considered as a solution to axial loading difficulties. The coupling between the prosthetic socket and the amputee’s residual limb is not completely stiff. This coupling can be thought of as being ‘a bit like a joint’ between two body segments. In this picture we see that the GRF of the person with the amputation does not ‘push’ directly up on the prosthesis. Rather it `pushes` up more medially. This creates a torque or moment around the coupling between the socket and the amputee. 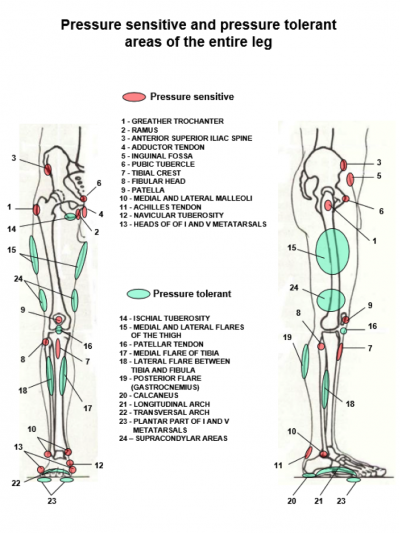 Soft tissue is compressed by the rotation, leading to pressure inside the prosthetic socket. The pressure that is developed as a result of the torque is shown by the red arrows below, proximal medially and distal laterally. This torque is resisted by soft tissue compression, in other words the socket torque causes pressure in specific parts of the prosthetic socket in a predictable way. Socket pressure issues should always be dealt with by a Prosthetist who understands the importance of alignment. Moving too quickly to altering the socket is not always a good solution in the clinic. Alignment changes are normally rapid and readily reversible with modern components. Forces are applied to the human body in Prosthetics, this will invariably lead to pressure. Pressure can be managed by increasing the area it is applied over and distributing it thoughtfully to pressure tolerant areas. Alignment of a lower limb prosthesis can have an effect on socket pressures in a predictable way Changes to a prosthesis can alter the prevailing biomechanical situation through limiting ranges of motion or moving the GRF. The Prosthetist is the key professional tasked with managing the prosthesis and its effects on the human body. The presence of the Prosthetist as part of the multidisciplinary team is essential for successful prosthetic rehabilitation. Use of knowledge of biomechanics by the Prosthetist adds significant scope for optimizing the biomechanical circumstances for the Prosthetic user.